Oh my, I didm’t think that we would be living in our Michigan house & I would still be blogging our NC house, but alas I did so many things while I was there & as we were moving out & didn’t have enough time to blog it all. I hope you are ok with me blogging about our historic rental while we are settling in here in our new home. Yesterday I shared our historic christmas rental with you guys & I promised to share a couple more full blog posts on certain rooms. 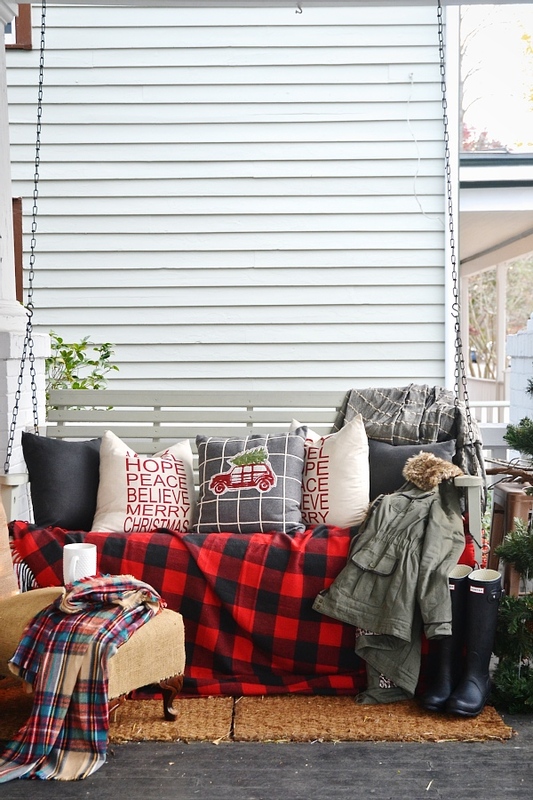 Today I wanted to share our porch in our historic rental all decked out for the holidays. 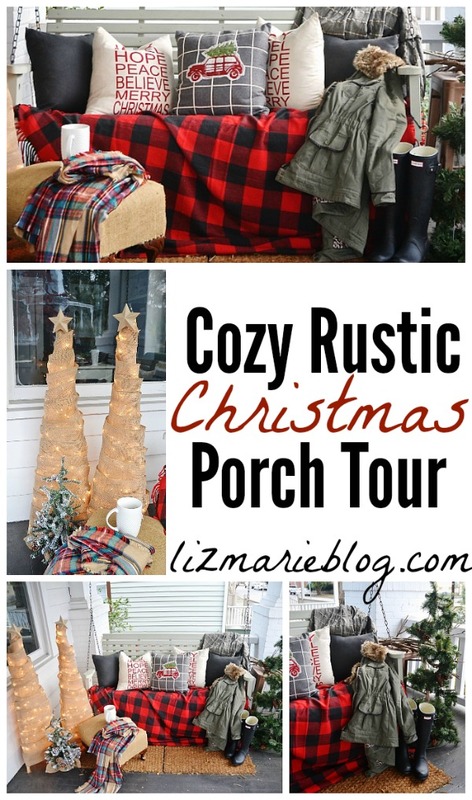 I hope you enjoy our rustic Christmas porch! 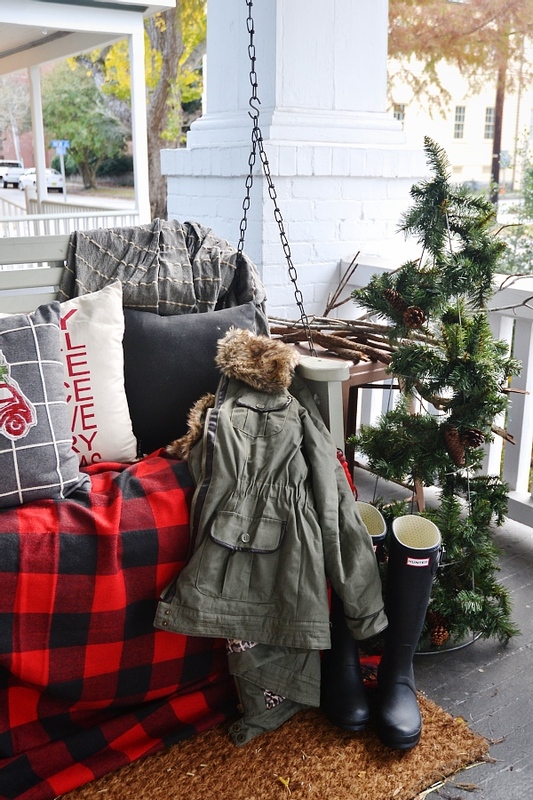 We made these burlap trees out of 3 simple pieces of wood attached at the top in a teepee or “tree” shape. We attempted different ways of attaching the boards at the top, but ultimately we went with hot gluing the tops together over screwing them together. This was a temporary fix, but they actually made it to Michigan just fine! We then stapled lights on the insides of the of the “wood tree”. After the lights were attached I wrapped the trees with burlap & kept it together with hot glue. After the trees were done I hot glued a star to the top of the trees to hide the tip of the tree where we hot glued. Voila! 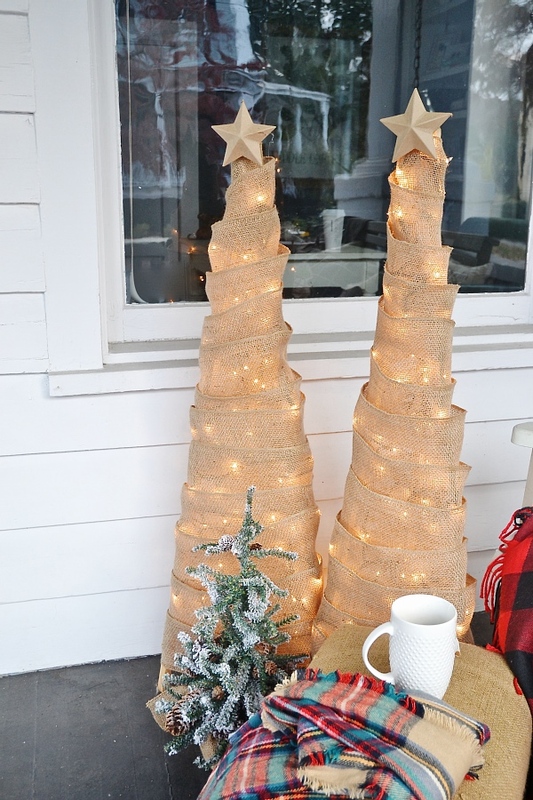 Some burlap Christmas trees! I have that very same blanket scarf ^_^! 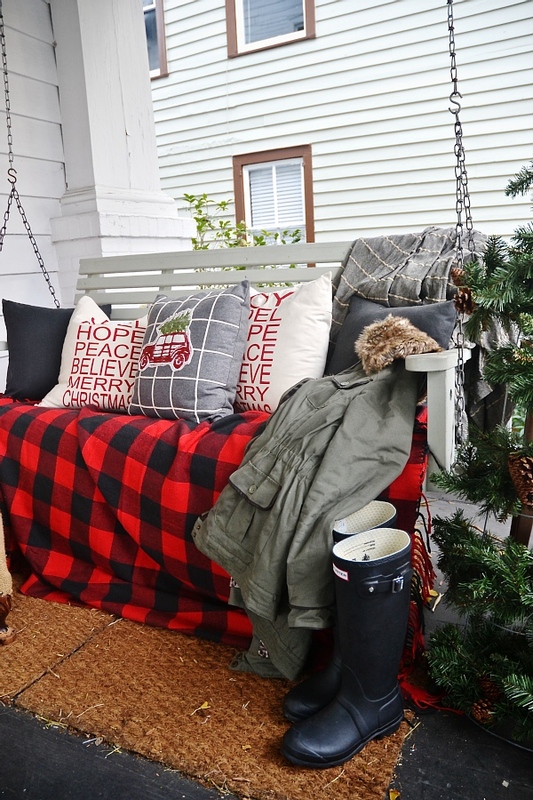 This porch is way too inviting :O I would not be able to leave it! Pair it with that hot cocoa bar of Yours ^_^ haha best cozy-combo! 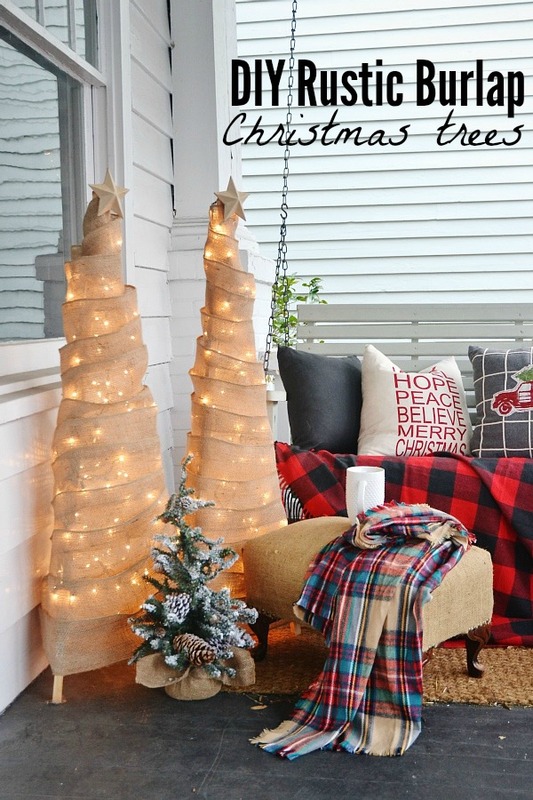 Looks great.. love the burlap trees! 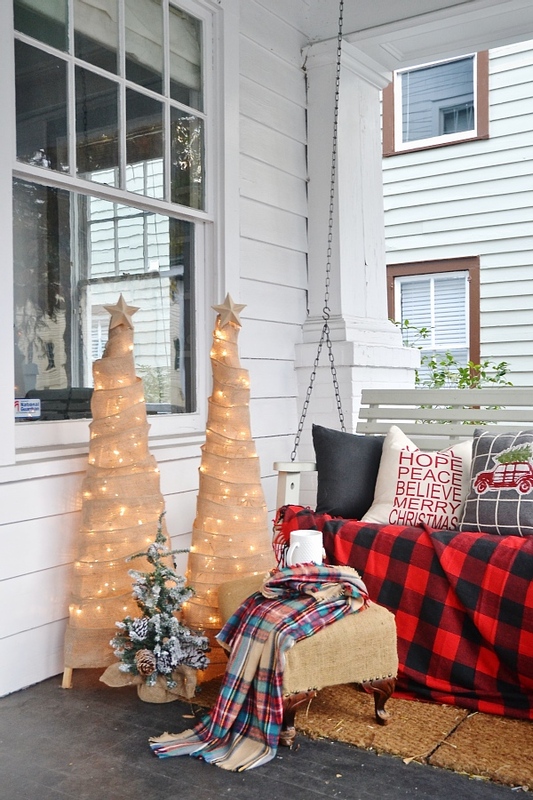 Those burlap trees are the cutest! i have a love/love relationship…*sigh* Beautiful scape liz! 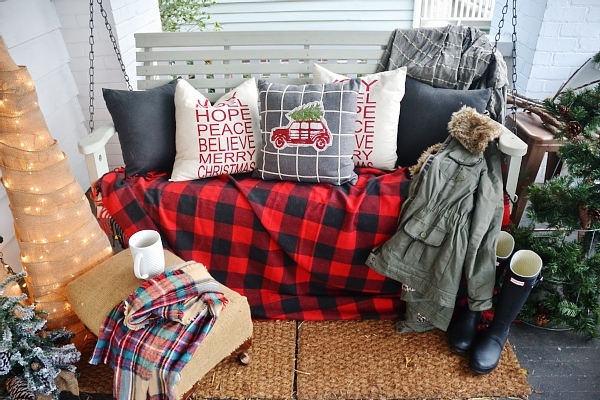 I feel a trip to JoAnns for some flannel will be happening tomorrow. The teepee trees are so fun & creative & festive!! Love it! The pillow from Target is so cute! 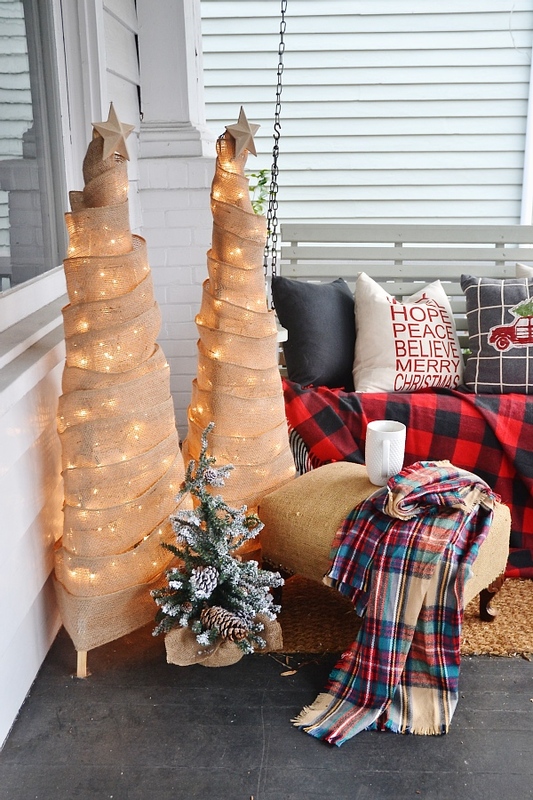 I too love the burlap trees. I can’t wait to see what you do in your new home. Thanks for the inspiration! I really love this. Your style is spot on to mine and I’m surprised every time, ha I don’t know why. I believe that is a scarf on your stool right? Because I just bought that scarf at Target the other day. 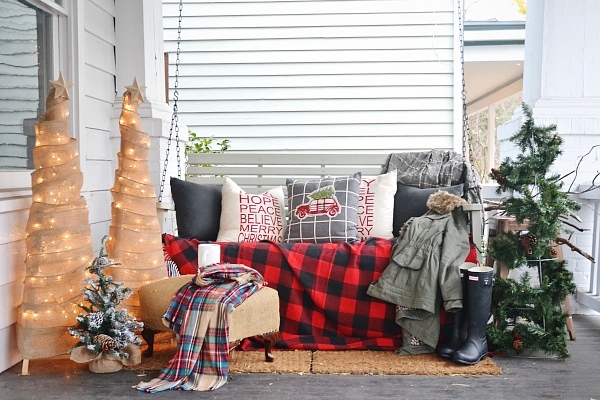 Also I’m going tomorrow to see if they have those pillows because I just love them. I love Target! Anywho hope the move in is going well. I love your trees and would love to try it out myself! 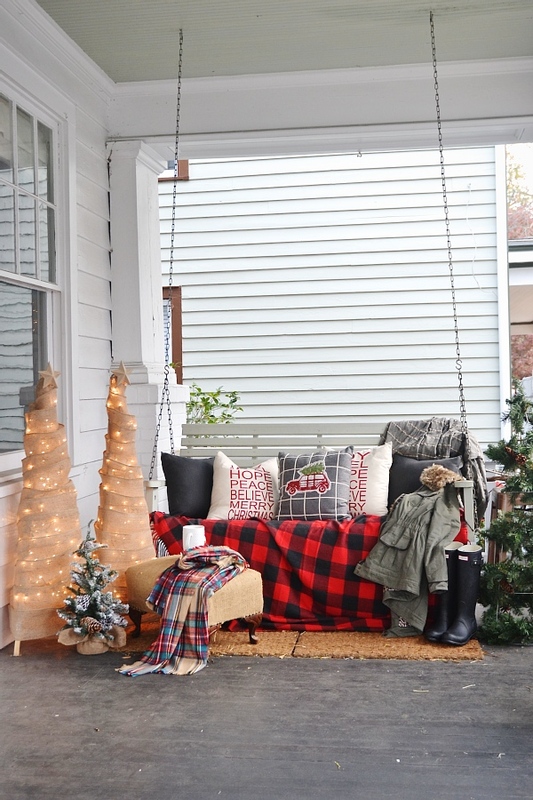 How tall are the trees and how many yards of burlap did you use?